This is such a bad film and not the “so good its bad” type of bad, just bad. 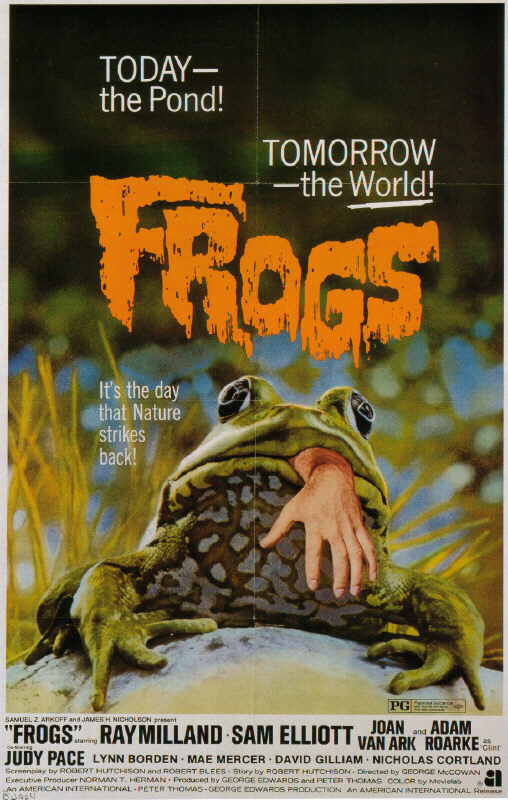 I remember I got this film on DVD back in the early 2000’s and it was 1 dollar, when I popped it in I was expecting some cheesiness(I mean come on a hand coming out of a frogs mouth is laughable), but about 10 minutes into the film I found myself scratching my head at how the hell this film could have been commissioned to be made and even worse how a big actor(at the time)like Sam Elliott could have been convinced to play in this. The film should be titled “Amphibians” or “Reptiles” as I don’t remember a physical attack made by a frog, lizard, turtles and other swamp creatures, the frogs don’t really do anything until the end and even than they don’t attack. The acting is just not up to par with anything resembling this type of flick and the way it is written and directed you can tell there was no love put in this film. This film would look better on the SyFy channel, but considering this was given a theatrical release makes it even worse. I can’t really say much about the film, I haven’t see it in years and the plot to me was just stupid when I watched it I didn’t care to remember it, except the family the reptiles are killing are those who have been killing the life in their home, so you can say its supposed to be The Birds but with amphibians and reptiles.